Beginner here, I installed Python 3 and have installed atom packages to run, but I haven’t been able make it work. Using Windows 10 and Python 3.6.3. I tried to add an environmental variable to PATH and Python works on the cmd prompt but it’s not recognized in Atom. Do I need to save Python files in a specific folder to run on Atom? Thanks for any help! I also tried with package platformio-ide-terminal 2.7.0 but again not recognized. Python 3.6.3 is definitely downloaded and named python.exe. And I tried to make an environment variable on PATH to it (from another help forum), I’ll upload a screenshot of that in a comment. Thank you again! Have you closed and reopened Atom since installing Python? The output in the screenshot is script. And whether or not you have to modify the PATH is determined by what you’re installing, not by what Atom package you choose. I have used Window’s Command Prompt application. Please publish the screen capture of your result. I think all of the common causes are covered, so this will require you to perform some deeper investigation. Fortunately, there’s a package that’s perfect for that. process-palette lets you execute any command from within Atom. You can use a terminal package too, but this one lets you customize a lot of the variables and save all of your configurations. All I want you to do right now is run the commands env and python -v.
I also get the same problem when I try and run programs in Atom. Can you screen capture the image of your environment variable? I don’t exactly know how to find the environment variables. Sorry, I’m really new to this! From Path, hit edit to see which files you have there. I’d suggest you to reinstall Python. This happened to me once, but after reinstalling it, everything went back to normal. 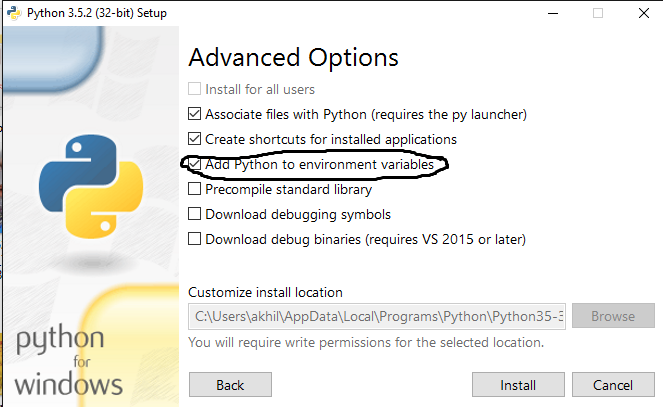 Also, make sure you tick Add Python to environment variables in the setup. Thank you for all the help from this forum - glad to say that I got it working! So, after some discussion, I had to re-install Python, but also make sure that Python was added to environment variable on installation. Additionally, I disabled the path length limit after installation. after going through of the same steps as you I find myself with the above issue,please help me. my_Dictionary.py is not a program. It’s a plain-text script that you need a program to interpret. The command you want is python my_Dictionary.py.